Drinking alcohol reportedly increases your risk of skin cancer. That's right, research reported in the British Journal of Dermatology finds there is a clear association between how much a person drinks in alcohol and how likely they are to get non-melanoma skin cancer. 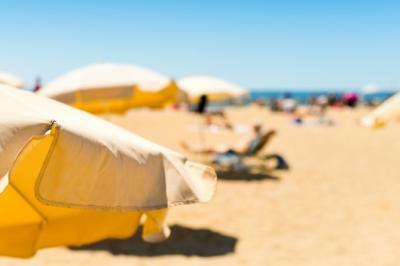 Some project that people who drink more booze might also engage in behaviors that lead to getting sunburned, while others say it is too early to tell. Nonetheless, to protect yourself the next time you plan on having a few cocktails, you might want to grab an umbrella, put on long sleeves, a hat and slather on some sunscreen just to be safe. No matter what risks you take in life, suffice it to say that bankers are working particularly hard to reduce risks when it comes to biometrics and banking. As an update to our April BID on voice-activated banking, we wanted to fill you in on the latest developments with Samsung. Samsung has partnered with three of the biggest banks in South Korea to introduce voice command banking. It will reportedly enable bank customers to execute financial transactions through cell phones. Under these partnerships, the South Korean banks' customers will be able to use a virtual assistant included in Samsung's Galaxy S8 cell phones. That assistant will issue voice commands for bank transactions. Customers will even have the ability to use voice commands to exchange currencies it appears. Samsung's deal with the South Korean banks represents the next step in voice command banking through a virtual assistant. Looking closer to home, Capital One introduced a partnership with Amazon within the US last year. Capital One bank customers are able to check their account balance, get information on recent transactions and even pay bills by issuing voice commands to Amazon Echo's voice assistant, Alexa. But, introducing voice command banking through mobile phones requires an additional layer of security. To provide that extra security, verbal commands for banking transactions will utilize the Samsung Pay app and Samsung Pass (an authentication program that relies on biometrics to verify users' identities). In this case, a user's identification is verified through iris scanning. As more and more mobile phone manufacturers incorporate biometric technology into their products, it not only will make it easier for the banking industry to expand the capabilities of voice commands, but will also give customers more peace of mind when it comes to utilizing such services. According to data from biometric security company HYPR, there are already more than 2B mobile phones around the world capable of various biometric verifications. Since the banking industry's biggest players are well aware of the rapid adoption of such capabilities, community bankers should be too. Wells Fargo for instance, has been actively testing mobile voice command banking with a group of its employees, with plans to introduce it soon; Citigroup is already utilizing fingerprint, face and voice recognition within its apps; and US Bank has been testing voice commands for its Visa mobile app. US banks are not just limiting the things customers can do with mobile voice commands to making payments or checking their balances, but are also trying to determine what other services customers would likely embrace. In the case of Wells Fargo, it is incorporating sophisticated search functions within its voice recognition technology that would allow customers to ask its app how much it spent on particular categories such as eating out at restaurants during a specific billing period. This level of detail will most likely push the envelope with other banks' offerings. The good news for community banks is that, as in many other instances, the industry's largest players are the ones investing the time and money into determining which functionalities customers will embrace. So, by the time such apps are adopted on a widespread level, third party providers should also be offering the same capabilities to interested community banks. For now community banks can wait in the shade as you protect yourself and monitor this for further developments. Yields rolled up 2bp as investors awaited news on monetary policy from Fed speakers in Jackson Hole. 1) Reliant Bank ($1.0B, TN) will acquire Community First Bank & Trust ($479mm, TN) for about $59.0mm in stock (100%) or about 1.86x tangible book. US federal law classifies marijuana as a schedule 1 drug under the Controlled Substance Act. Beyond marijuana from a federal view, other drugs in this classification include Ecstasy, LSD and Heroin. According to the Act, Schedule I drugs have a high potential for abuse, have no currently accepted medical use in treatment in the US and have a lack of accepted safety for use of the drug or other substance under medical supervision. Under state laws, marijuana is medically legal in 29 states and recreationally legal in 8. FDIC data finds that from Q2 2016 to Q2 2017 the number of financial institutions with assets <$1B declined by 292 or about 5% to 5,035. HSBC Holdings Plc, Citigroup Inc. and Morgan Stanley note that increasing indicators, such as investors disregarding valuation basics, could mean a downturn is coming. Around the world, assets are the least correlated with rates, equities and oil in almost 10Ys.